Earlier, a witness told Reuters that up to three gunmen fired on about 40 people inside the Quebec City Islamic Cultural Center. Police put up a security perimeter around the mosque. Quebec police confirmed the shooting at a Quebec mosque in a tweet, and police on the scene said there had been fatalities. “There are many victims … there are deaths,” a Quebec police‎ spokesman told reporters. A police tweet said there were deaths and injuries and that suspects had been arrested. Like France, Quebec has struggled at times to reconcile its secular identity with a rising Muslim population, many of them North African emigrants. The face-covering, or niqab, became a big issue in the 2015 national Canadian election, especially in Quebec, where the vast majority of the population supported a ban on it at citizenship ceremonies. Incidents of Islamophobia have increased in Quebec in recent years. In 2013, police investigated after a mosque in the Saguenay region of Quebec was splattered with what was believed to be pig blood. 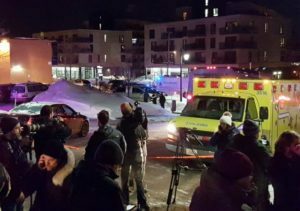 Two people have been arrested after a shooting at a Quebec City mosque on Sunday, said a police spokesman who confirmed there were deaths and injuries but declined to give a number. A Reuters eyewitness saw heavily armed tactical police entering the mosque. Police spokesman Etienne Doyon declined to say whether there was a gunman inside the mosque.